The Conference of the Birds was commissioned by A Far Cry and premiered at New England Conservatory’s Jordan Hall in Boston, MA on January 13, 2017. 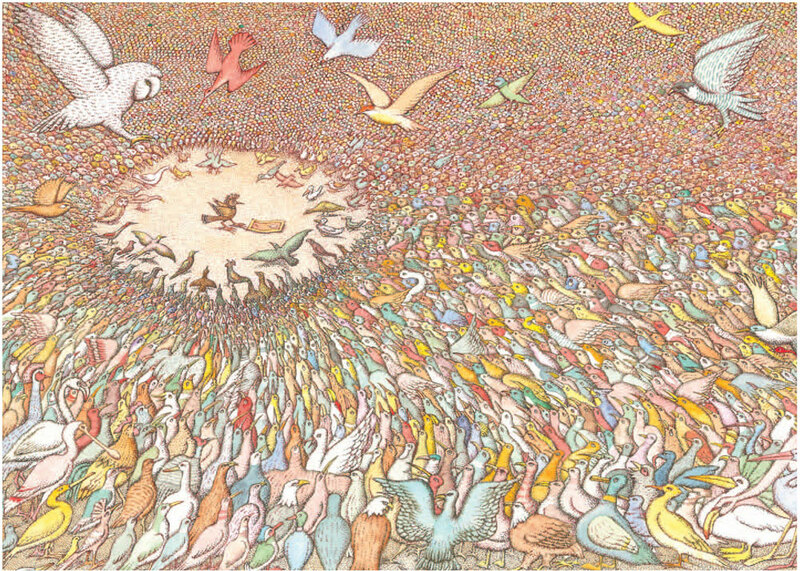 “The Conference of the Birds” is a 12th-century Sufi epic poem by the Persian poet Farid ud-Din Attar. 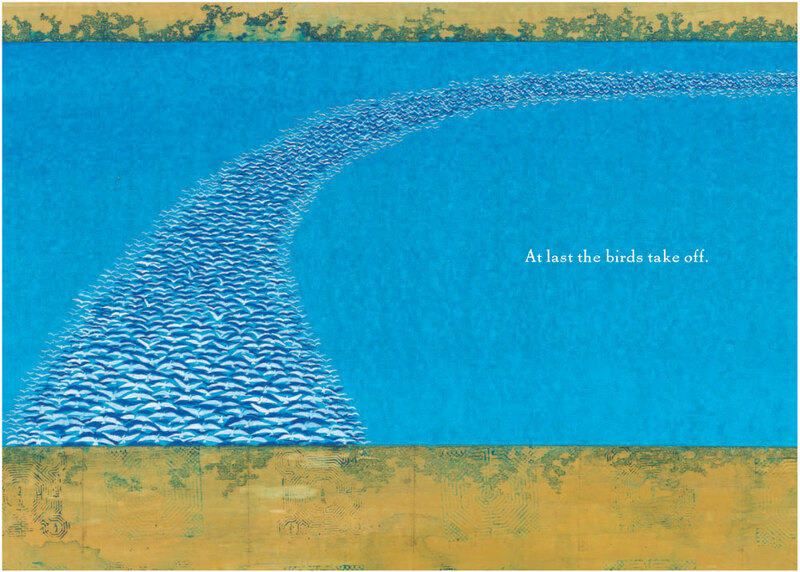 It tells a story about the birds of the world who gather together in a time of strife. Led by the hoopoe bird, they decide to set out on a long journey to find their king. Many birds desert or die along the journey, but after passing through valley after valley, the remaining 30 arrive at a lake at the top of a mountain. Looking in the lake at their own reflection, they realize they are in fact looking at their king. I first came across it through an adaptation by the brilliant Czech-American illustrator and author Peter Sís. 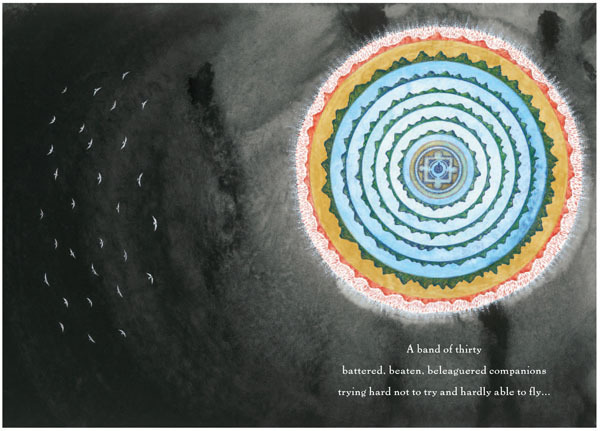 This was one of the most beautiful books I had ever seen: an adult picture book with an unusual graphic sensibility, a concise and beautifully ambiguous text, and full-page illustrations of mysterious landscapes that carried surprising emotional weight. 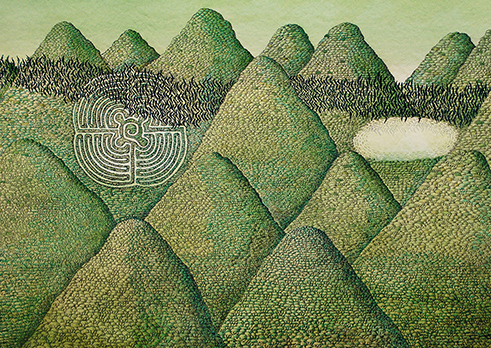 Numerous adaptations of the original poem, including plays, children’s books and pieces of music, emphasized the story’s simple yet colorful narrative and moral didacticism, but what drew me to Sís’s version, aside from the expressive, textural drawings which so suggested music, was the deep sense of loss in the pages. So many birds are left by the wayside during this journey towards truth and self-discovery. Does progress or attempted progress always come at a cost? What are we to make of the hoopoe who leads so many others to their deaths even as a few find enlightenment? I initially thought about trying to turn the story into an opera – but I realized I was less interested in the narrative scope of the story than in the emotions and visceral energy of specific moments. I also knew I wanted to write music as Sís created his drawings, with strong gestures and lots of small figures combining to form large shapes. A string orchestra seemed perfect for creating solo lines that gathered into clouds of sounds. When I began talking to A Far Cry about writing a piece, I realized this would be a perfect project for the group. Having gotten to know the group, I wanted to write music for individual personalities: each member of the ensemble has his/her own part. These parts join each other in different combinations, but just as quickly split up again. The leadership of the music, and the relationship of individuals to the group is always changing. As I wrote I thought about the power of crowds, the motivating capability–both dangerous and inspiring–of leaders, and the distinct values of individuality and unity, but I also thought about the players of A Far Cry, and how much I admire the way they function as an ensemble, share leadership, and make music together. “The Conference of the Birds” is about 25 minutes long and is in three movements. The final two are played without a pause. The Conference of the Birds…left me admiring the composer’s imagination and extremely excited to hear what he gives us next…the enthusiastic ovation accorded [it] made clear that this was the work that excited the audience the most. And deservedly so: Inspired by a 12th-century Persian epic poem, it’s a powerful picaresque odyssey for 18 strings, no two of their parts alike. So it felt like a celebration of the gifts of each individual among the SPCO’s string players, as solo voices emerged from unexpected places…Whenever a spirit of conformity informs the music, some rebel spirit explodes from the flock. Its tone is sometimes agitated, other times elegiac, but always fascinating. And it contains the most creative use of sandpaper I’ve encountered in a musical work. One did not need to know the story of the Conference to admire the proliferation of swooping bird calls in the first movement: the 18 players had individual parts, making for a richness of detail that never became cacophonous. The “birds” become less numerous as the second movement moves from order to disorder and by the end of the third movement only four players remain, the other musicians having “played” sandpaper below them, creating an uncanny rustling static: it was an oddly affecting gesture of self-effacement…[The Conference of the Birds] is worthy of re-hearing, from a composer worth following. “[The players] careened through musical dialogues with ever-changing leaders as many birds voiced their opinions, ending the first movement with a chorus of blunt, percussive strikes that slowly erupted into a takeoff en masse…In Conference of the Birds, each instrument’s contribution was distinct, but unified. The birds’ takeoff soared, the distance between the earth and sky becoming at once infinite and infinitesimal. A radio preview with Lembit, A Far Cry’s Alex Fortes, and host Bill O’Connell on Cleveland’s WCLV.